Charles Mason ended a three-month visit to Sierra Leone, assessing the conditions in his homeland after living abroad for over a decade. I interviewed him from Freetown to get these impressions and findings of his. I had my initial schooling in the provincial towns of Bo, Kenema, Moyamba and Magburaka in Sierra Leone. I attended schools in the provinces because my parents were fortunate to hold senior positions in the nation's civil service. After Sierra Leone's independence on April 27, 1961, its educated nationals became natural successors to British colonial expatriates. These folk also rose to senior administrative positions in the civil service. I was fortunate to have lived in the "reservations" while my parents were stationed at various provincial towns at different periods. They marched briskly, swinging their arms, singing and parading in single file like an infantry, to the tune of creative music from improvised metals, including the school gates, while the rod of correction pitched the rhythm. Sleepy and tardy kids were asked to join the back of the line, who would repeat the process several times over. I recall the green and red polished mansion floors and the professionally painted houses. A semblance of that culture exists only in Kenema. The rest of the cities bear no trace of the same. While in Bo, I visited my alma mater, Christ the King College. Christianity was first planted in this former British colony through the establishment of churches and schools. I trekked through the same road I knew when I went for an interview in 1966. I saw the same houses and landmarks that were not well kept structures compared to those heydays. Nothing much has changed except the new buildings coming up in the outskirts of the town. Where have all the flowers gone? I wondered. The complete cost of an 11-year civil war in Sierra Leone probably was not computed accurately, since the nation failed to record many vital statistics. Seven years after the menace, visible scars are still present in the outskirts of the big provincial cities. Entering Kenema township from Bo highway seemed different from my first impression of Kenema Township in the mid-60's when the roads were well maintained by the Public Works Department. Presently, one could hardly find a six-mile road that is well maintained. The areas I've visited so far confirmed my intuition that Kenema's population has grown rapidly, with increasing construction of new houses. Okada bikers are having a field day here, as most taxis avoid trips to other towns and villages because of the horrible road conditions. They can maneuver through the treacherous roads to get passengers to their destination. Most motor bikers carry three passengers instead of one. People riding alone with the biker are charged the price of three riders. I wonder whether the traffic police condone this risky behavior of overloading the motorbikes. My Jeep was stationed at a police checkpoint. I saw the biker stop some 200 meters from the checkpoint, allowing the excess riders to walk to the check point and show their IDs. I was told that the accident rate among bikers is very high. Interestingly, the biker wears a helmet but seldom would the riders do likewise. Visiting the coffee and cacao plantations, I noticed that most of the help who should have been utilized maintaining the plantations have deserted to big cities where they can become hustlers by day and thieves by night. Going through the mining town some 30 miles off Bunumbu Town, I was amazed to see the influx of shady foreign dealers in that small village, buying gold dust that they could easily smuggle across the porous borders to Guinea and Liberia. They bear the moniker "Julah men" without license to buy and export gold. This is a very vital avenue where government is losing much needed revenue. The road leading to this village is terrible. Rice farms could develop along the proximity of the motorway. The progress made in various towns and villages is not encouraging, as the largest rice farm is about three acres. There are other farms with maize, groundnut, cassava and vegetables. The terrain leading to the Eastern Province is mountainous. I did not see tractors working on any of the farmlands. Journeying through the Northern Province gave me a different impression. Seemingly, people in this area are more business and agriculturally inclined. I was amazed seeing people hawking fresh fruits, used clothing, cigarettes and cold beverages along the roadside. Large towns like Lunsar, Makeni and Matotoka have a high volume of commercial activities going on in towns and villages. Unfortunately, the population of beggars has increased exponentially; amputees, blind and deformed people are very visible and miserable. Some of them are on wheel chairs. But who takes care of them? The moment a vehicle stops, it is stormed by a colony of beggars. How can the government help them when it survives as a beggar itself? There are more baby strollers in Sierra Leone than one would imagine. But the strollers don't carry babies in them. They are used as transport for coolers containing ice cream, soft drinks, beer and energy drinks. People here are ingeniously creative, striving to peddle their goods to remain on top of the survival game. If Sierra Leone should chart its own destiny, identity and dignity, navigating away from a culture of dependency with a donor driven economy, then serious emphasis should be placed on education. The nation's educational system needs a complete overhaul to become relevant to the challenges of a volatile global economy. 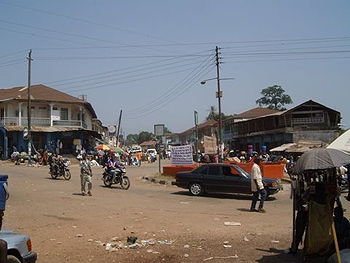 The Eastern Polytechnic, with its headquarters in Kenema, is heading in the right direction. It was established as a result of a merger of two major government institutions, the Bunumbu Teachers College and the Government Technical Institute. It is now a three-pronged tertiary institution with campuses at Woama in the Kono District, Bunumbu in the Kailahun District, and the Kenema District. But inadequate funding and the necessary government support hinders the vision to modernize the institution and recruit skilled professional staffs. The restoration of the Peace Corps program by the Obama administration would benefit Sierra Leone immensely, especially in the field of higher education where specific and technical skills are in short supply. Financial support to its institutions is the elephant in the room. Major ongoing projects include the construction of an ultra-modern multi-story library and establishment of a school of nursing. A Bachelor of Education degree program in secondary education is in progress, while Bachelor of Science and Bachelor of Technology degree programs are in the works. Eastern Polytechnic recently opened a computer lab with an Internet facility. Once these projects materialize, the youth will have new opportunities to acquire modern skills that will equip them for today's unstable job market. The obsession of going abroad to obtain those skills will be greatly reduced. Developing nations need to invest heavily on education, which is the catalyst and fuel for development. Creating and spreading opportunities for gainful employment all around Sierra Leone could halt the exodus of people to Freetown and abroad, especially the young at heart, passionately searching for a better life in a capital city that has reached its capacity. Roland Bankole Marke is the author of Teardrops Keep Falling, Silver Rain and Blizzard and Harvest of Hate (Fuel for the Soul). Scores of his essays, stories and poetry have been published in several publications, including Worldpress, Guardian Weekly and Pambazuka. His website is www.rolandmarke.com.